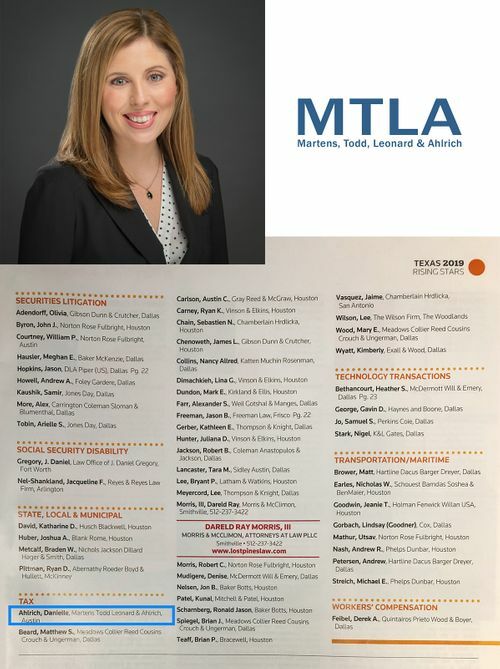 Martens, Todd, Leonard & Ahlrich is pleased to announce that Danielle Ahlrich has been selected as a Texas Rising Star in business tax for the third year in a row. The Rising Stars list is comprised of the top up-and-coming Texas attorneys who are 40 or younger or have been in practice for 10 years or less. No more than 2.5 percent of Texas attorneys were chosen for this honor.